George Baker Sr. Born: Sun., Jun. 5, 1927 Died: Tue., Nov. 22, 2016 George Baker Sr., 89, of Niles died at 12:25 a.m., Tuesday, November 22, 2016, at St. Joseph Warren Hospital. George was born June 5, 1927 in Niles, Ohio, the son of Brown and Barbara Feder Baker. A lifelong area resident, George worked for RMI Co. as a crane man, retiring in 1991 after 43 ½ years of service. George was a veteran of the U.S. Navy, serving his county during WWII. He dropped out of high school to enlist in the Navy, but he was a proud graduate of Niles McKinley High School earning his diploma in 2002. 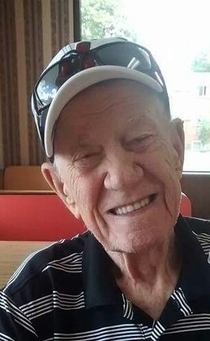 He was a member of St. Stephen Church of Niles, where he was captain of the Ushers Club and was a volunteer at the Saint Vincent DePaul Society. George loved following all kinds of sports, especially his Cleveland Indians baseball team. George is survived by wife Mary Lawrence Baker, whom he married on May 28, 1994, three sons, George (Vicky) Baker Jr. of Grandville, Ohio, Greg Baker of Niles, Tommy (Pamela) Baker of McDonald, Ohio, three daughters, Judith Ann (Jim) Dupler of Deerfield Beach, Florida, Patricia Kuhn of Mineral Ridge, Ohio, Tracy (Don) Eckrote of Mineral Ridge, Ohio, thirty five grandchildren and many great grandchildren. George was preceded in death by his first wife Mary A. Baker, who passed away on March 27, 1993, two sons, James Baker, David (Bobby) Baker, a daughter Mary Alice McCarley, four brothers and two sisters. A Service of Christian Burial will be at 10 a.m., Saturday, November 26, 2016, at the Holloway-Williams Funeral Home & Cremation Service, 611 Robbins Ave., Niles, Ohio. Family and friends may call from 4 p.m. to 6 p.m., Friday, November 25, 2016. Interment will be in Greenhaven Memorial Gardens. The family request that material contributions be made in George’s name to Hospice of the Valley. Family and friends may view this obituary and send condolences at www.hollowaywilliamsfuneralhome.com. Please share your memories of George.